The owner put it up for auction in recent weeks. It’s a sign of the times. The new reality of the luxury real estate market didn’t cooperate with the opulent hopes and dreams he had for the property. Maybe the asking price of the last few years — $159 million — had something to do with it. You might’ve read about Le Palais Royal. The 60,000-square-foot mansion sits on 4 acres of prime South Florida beachfront. That includes $3 million worth of gold leaf encrusting the front gate and entryways. For a time, there was talk of adding a helipad and a $7 million “entertainment complex”— complete with a Star Wars-themed indoor go-kart track — on an adjoining lot. Those plans never materialized. Neither did a buyer. That’s the story everywhere these days. Even the once-booming luxury home market in San Francisco has cooled off. September was the region’s slowest sales month in more than a decade. 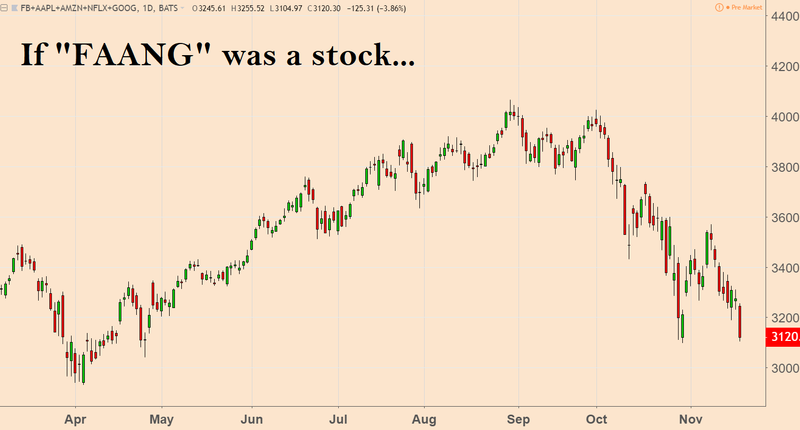 As stock investors, what are we to make of all this? Think of the mansion as a poster child for the rougher, tougher investing environment we face these days. We’re in an era of rising interest rates and declining liquidity — both courtesy of the Federal Reserve’s policies over the last three years. That means we look harder for value, such as the positions in the Total Wealth Insider model portfolio. In recent months, I’ve noted many times the great values in beaten-down sectors in consumer staples, among retailers and among telecommunications companies. And like that beachfront mansion, we can’t buy stocks “for show” anymore, either. You know what I’m talking about. People bragged about owning the so-called FAANG stocks (Facebook, Apple, Amazon, Netflix and Google) because that was the cool thing to own, regardless of price or overvaluation. For a legion of investors, those stocks were the only thing to own. But the declines of the past month, an average of around 27% between the five stocks, show that no stock is immune as the Fed acts out its part. This is one of those moments when it pays to have some extra cash. There’s a wholesale exodus going on among the premier companies in the technology sector. It’s quite likely that when the smoke clears, more than a few of yesterday’s overvalued tech companies will become tomorrow’s value plays. « Previous Will China Come to a Trade Agreement?